It's not often these days that I get really excited about a palette. Alright, who am I kidding? I get excited about palettes a lot, but rarely enough to actually buy them. Truth be told, I own more than my fair share of eyeshadow palettes and even I have to hold up my hands and admit that fitting additional palettes into my makeup drawers is beginning to feel like a game of Tetris. These days, when I see a palette I love, I hop on over to Temptalia, ogle the gorgeous swatches and usually get over it. 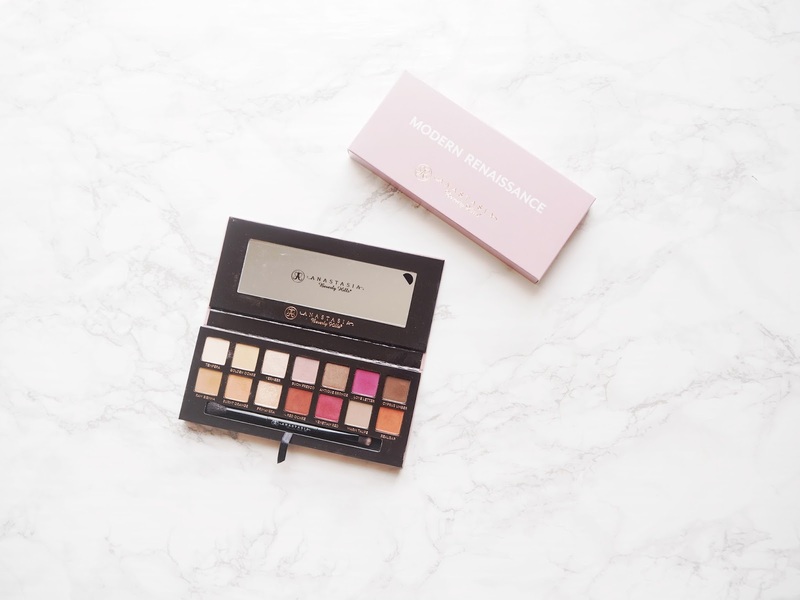 That was, however, not the case with the Anastasia Beverly Hills Modern Renaissance Palette. I own a lot of neutral palettes, hence why I no longer feel the need to buy more, but I definitely did not have a palette like this in my collection yet. I love berry tones and warm eyeshadows. They're some of my absolute favourites to create eye-looks with. I think the bold shades are stunning and they really make blue eyes stand out. I started seeing this palette everywhere in the blogosphere and on social media. Slowly but surely I decided that I needed to have it. I ended up ordering it from Cult Beauty and within a week it had arrived. Let me tell you that this is, in my opinion, one of the most gorgeously packaged palettes I have ever seen. I am all about the pink velvet "trend" of sorts that has been circulating lately and this palette is encased in blush-coloured pink velvet. The packaging, being made of cardboard, is not the sturdiest I've seen, but it's lightweight and seems to be the type to travel well, so I'm really not that bothered by that. It also comes with a little double-ended brush, which is definitely a nice touch. I don't think I like the brush as much as I do the ones that are sold with the Urban Decay Naked Palettes, but it's definitely still a decent brush. The palette houses a sizeable mirror and fourteen pans of eyeshadow. The shadows are a mix between mattes and shimmers; eleven mattes and three metallic shades. Whilst a first look at the palette will give you the impression that it's a very bold shade selection, there are actually a whole variety of neutral shades to choose from, peppered with a good selection of brighter colours too. Onto the formula: the two most metallic shades in this palette, Vermeer and Primavera are buttery as anything, gorgeous to swatch and to apply and all round great shadows. The rest of this palette, however, does consist of matte shades, which I find to be generally more difficult to get right. Whilst for the most part the shades are pigmented and blendable, there are a few that are ever so slightly powdery and more difficult to apply evenly. Don't get me wrong, they're still great shadows, but the quality does vary slightly between some shades. Nonetheless, there isn't one shade in here that I would deem a dud, they all perform well and look good on the lid. In terms of wear time, I can apply these shadows in the morning (on top of an eyeshadow primer) and they'll last well for about eight hours before showing signs of fading. They do not, however, crease or look patchy (even in this sweaty weather!). From left to right: Tempera, Golden Ochre, Vermeer, Buon Fresco, Antique Bronze, Love Letter, Cyprus Umber, Raw Sienna, Burnt Orange, Primavera, Red Ochre, Venetian Red, Warm Taupe and Realgar. I absolutely love the versatility of this palette. 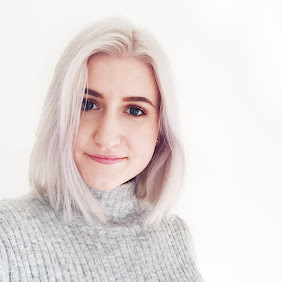 Whilst I totally understand that the bold, warm-toned shades aren't everyone's cup of tea I'd like to think that there's a little something in here for most people. This is by far one of the best palettes I've ever bought and I'm happy that my usual "But I really don't have anything like this yet!" justification actually rung true with this one! Overall, I really highly recommend this palette if you've been considering picking it up for a while. 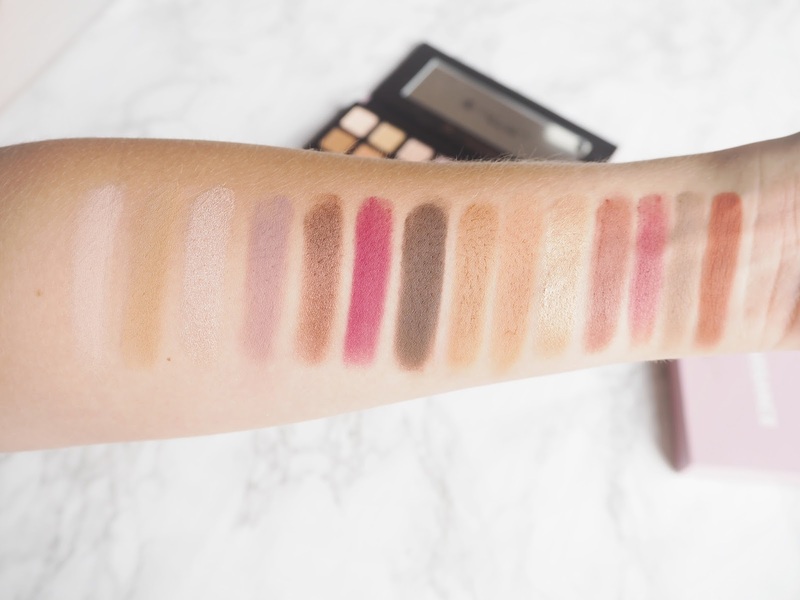 As I've already said about five times, it's something different than the usual (but still lovely) neutral eyeshadow palettes that most of us makeup enthusiasts already own far too many of anyway! 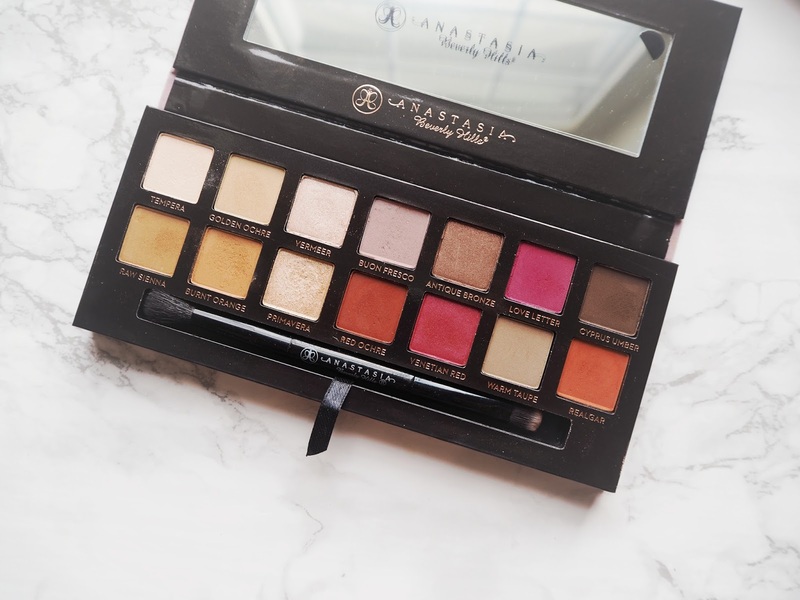 Have you tried the Anastasia Modern Renaissance Palette? Seen this palette everywhere recently, its so pretty! Love letter is the most beautiful shade! I really want this palette I just don't know if I can justify it when I have so many palettes already! Primavera is such a stunning shade/heart eyes emoji/ I've seen this palette practically everywhere on the blog, but this is my first time knowing it's packaged with velvety pink box! The pink shades are so nice!! Saving up for this palette at the moment. It's so gorgeous!